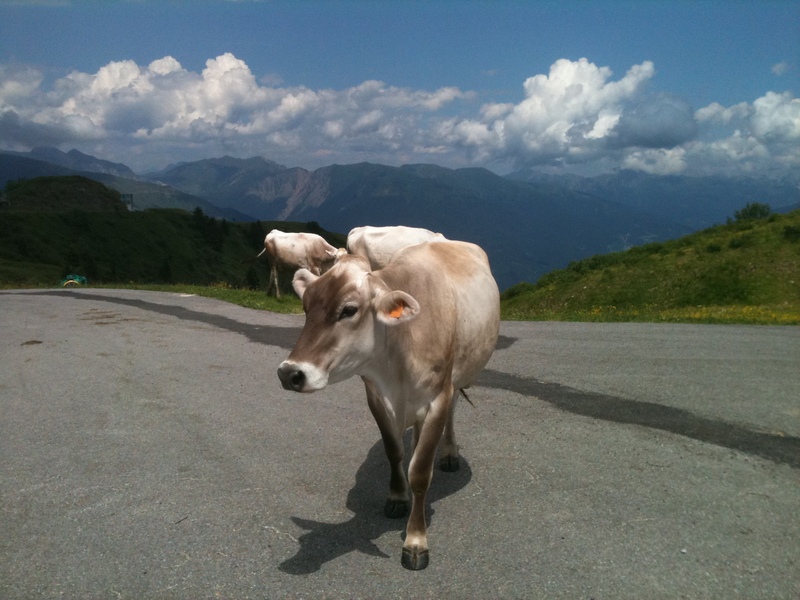 In July 2011 Cyclopaat – accompanied by Paula – made a trip through the Italian Alps, dubbed ‘Giro d’Italia 2011’. It consisted of two parts, one based in San Pietro (Val Gardena) and the second part based in Valdidentro (Bormio). In between, they played the OEMC (Open European Mahjong Championship) in Venice and he conquered the Monte Zoncolan (Ovaro) on their way there *. When he planned the trip earlier that year, the altimeter calculation gave him close to 14,000 meters in little over 200 kilometers of climbing. He was impressed at the time, but before leaving, he already added several challenges he found using ‘Cycling the Alps‘ and he was aiming for 20,000 altimeters. The posts on the various trips and climbs make it clear that it wasn’t easy – he has a good recovery capacity, so once he conquered another climb, he’d forget the struggle and just enjoy the achievement. Once back in the hotel he probably made it look a bit easier when finally writing his reports, but the truth is he had a hard time more often than not. On the other hand: considering that the purpose of the trip was to test his climbing capabilities for the Alpe d’HuZes challenge next year, it wasn’t supposed to be easy. You do not brag yourself up the Alpe d’Huez six times in a row – you will have to physically push yourself to the limit. The Mortirolo on the other hand – tackled after 4 days of relative rest, while playing at the OEMC – was not as difficult as he expected. Perhaps the experience on the Zoncolan – and the break – helped him ‘conquer’ this climb slightly more ‘comfortable’. Besides the average incline being lower (10.3% compared to 11.9% for the Zoncolan), the temperature at the start was around 5 degrees lower and going down while ascending, instead of going up like on the Zoncolan. Plus, there’s are more tree covered, shady, stretches to be found on the Mortirolo. The longest ride in this Giro d’Italia 2011 was 99.15 kilometers, with 2,866 altimeters – about half the distance was uphill. Greatest altimeter gain in a single ride was 3,061 altimeters, during a 60.1 kilometer ride – the altimeter gain was made in 42.75 km of climbing. The weather during the first part of the stage was much better, although the high temperatures also had disadvantages. Going uphill without his helmet on, he burned – and on the Zoncolan almost boiled – his head, but at least he could ‘cycle light’. The better half of part two was ‘rainy’ and not unexpectedly – due to both weather and altitude – the Gavia and the the Stelvio were the coldest climbs he undertook; on Sunday the temperature at the top dropped almost to the freezing point. Because of that and an ‘icy’ rain, he had a very hard descend (memo to self: take long-fingered gloves with you next time!). The other 2 arrivals at the top of the Stelvio (and the Gavia for that matter), were the end of the trip and he did not descend by bike. This has been both the best and the hardest mountain training yet. If anything, it was satisfying 🙂 But he still doesn’t have a good idea whether or not he will be able to climb the Alpe d’Huez six times in one day. Oh well, there’s still a lot of time to prepare! ‘Best of’ picture gallery of the Giro d’Italia 2011 on my Google+ pages here.